The Urethane Cap is an excellent middle ground sealing choice between the Capped T-Seal and the O-Ring loaded seal. The Urethane Cap features two sharp sealing lips, but is a specially designed to include a basin that provides for a cache of lubricating fluid. This allows for a higher amount of sealability than a T-Seal, but lubricates the surface enough to reduce the risk of stick slip. The Urethane Cap, just like both the T-Seal and O-Ring loaded seal is designed to fit within a standard O-Ring groove. 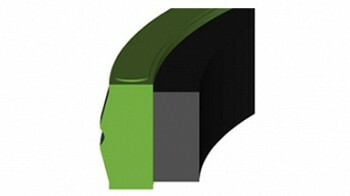 A feature not found in other bi-directional seals is that the Urethane Cap includes grooves that are cut into the side of the seal face. These grooves are designed to reduce blow-by failures if there is a sudden change in system hydraulic pressure. Made from hard extrusion and wear resistant polyurethane, the Urethane Cap also features a rectangular energizer under the polyurethane cap. The square shape of this energizer is more stable than a round O-Ring would provide and this further reduces the risk of seal damage during installation and usage.